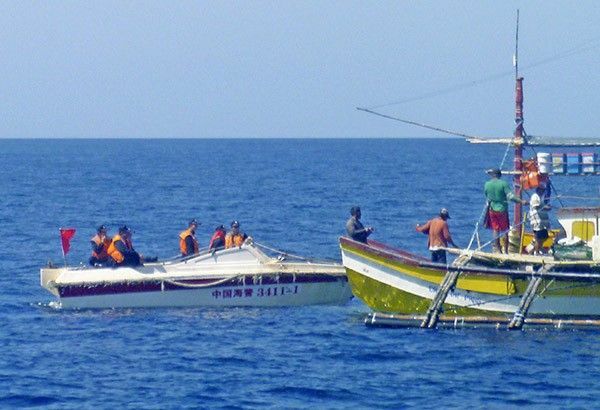 In this Feb. 27, 2015 photo provided by fisherman Renato Etac, Chinese Coast Guard members approach his fellow fishermen near Panatag (Scarborough) Shoal in the West Philippine Sea. MANILA, Philippines — The Bureau of Fisheries and Aquatic Resources' suggestion for local fishermen to catch fish in the West Philippine Sea would be "highly improbable" with the presence of the Chinese, a militant fisherfolk group said. The Pambansang Lakas ng Kilusang Mamamalakaya ng Pilipinas (Pamalakaya) pointed out that Filipino fishermen could not fish peacefully in the contested waters anymore. Last week, BFAR's Mimaropa division urged local vessels and large commercial fleets to catch fish in the West Philippine Sea as it is a less-exploited area and would help other fishing grounds rest. "Who says we don’t want to fish in the West Philippine Sea? If only we have our full control over the waters, BFAR no longer needs to encourage us to go there, because basically, we will fish in our traditional fishing grounds," Pamalakaya National Chairperson Fernando Hicap said in a statement. Pamalakaya called on BFAR to urge President Rodrigo Duterte to instead uphold the country's sovereign and territorial rights over the West Philippine Sea. "Instead of merely encouraging us to conduct fishing expedition in the West Philippine Sea where there is a heavy presence of Chinese personnel, BFAR should pressure President Duterte to take a strong stand against Chinese incursion of our waters to let the Filipino fishers catch our own marine resources," Hicap added. The fishers group further noted that Beijing's reclamation activities and military installations have affected the disputed waters' marine biodiversity and resources. "Aside from getting China out of our waters, the government should demand them accountability and compensation for causing environmental disaster and damage to one of our rich marine territories," the Pamalakaya chair said. Marine experts have warned that fishing resources in the South China Sea, part of which is the West Philippine Sea, is "in danger of collapse" unless claimant nations act urgently. In a report issued September last year, Washington-based think tank Asia Maritime Transparency Initiative said that the disputed sea is "seriously threatened" by overfishing encouraged by government subsidies. “More than half of the fishing vessels in the world operate in these waters, employing around 3.7 million people, and likely many more engaged in illegal, unregulated, and unreported fishing,” the think tank said. In June, a GMA News report showed that the Chinese continue to harass Filipino fishermen in Panatag or Scarborough Shoal. A video showed Chinese coast guard personnel going aboard the Filipino fishermen's boat and taking their catch. Days after the report was aired, local fishermen appealed to the Philippine government to act on the sort of barter trade between the Chinese coast guard with Filipino fishermen in the traditional fishing ground off the coast of Zambales.